Festive Penguin Red Badge in a lovely red colour with a picture of a festive penguin wearing a Rudolph the red nosed reindeer antler headband. 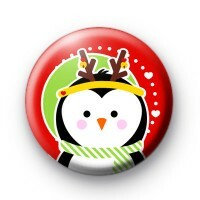 These Festive Penguin Xmas badges are perfect to wear to your Christmas party & will look fun pinned to your party outfit. They are also good to use as Christmas decorations, especially pinned to your gift wrap ribbons on your Christmas presents. Our Xmas badges make great stocking fillers & secret Santa presents. Standard 25mm badge made by hand in our family run workshop. We offer worldwide delivery on all orders & free delivery is available on larger orders. We also offer Next day delivery within the UK, which is available during checkout.